ePublishing Knowledge BaseePublishing Knowledge BaseePublishing Knowledge Base Creating, Managing, and Selling Products I want to have flat rates for international shipping, regardless of country. How do I do that? You can set flat rates for international shipping. However, each country you want to support for shipping must have its own Shipping Zone record. However, each country can have the same external ID number, which means you can have one shipping rate that applies to all of them. In the Shipping Rate Manager, you would then create Shipping Rates that meet the flat rate costs you want to allow for different weight classes. NOTE: If you don’t want to manually create unique shipping zone records for all 190+ countries, we can do a one-time database update to create these for you. This may be a billable item, though. There are some countries that have a reputation for fraudulent activity. You may want to consider whether you want to allow purchases from and shipments to those countries. Please talk to your payment processor to learn which countries those are. 1. 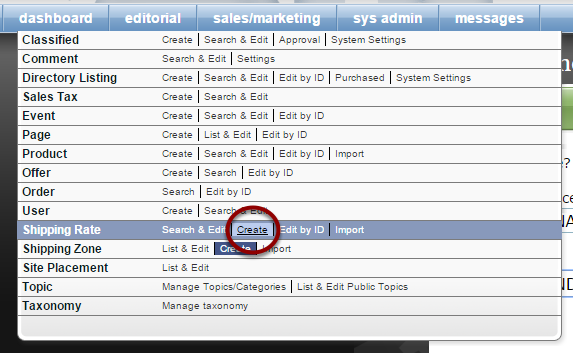 To create a new shipping zone, click Create next to Shipping Zone under Sales/Marketing in your dashboard. 1.1. 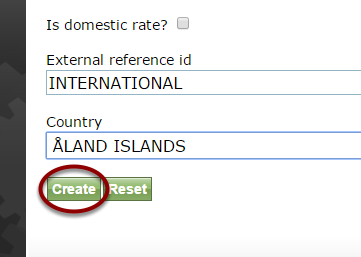 Select the country from the dropdown. 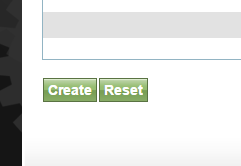 Zoom: Select the country from the dropdown. 1.2. 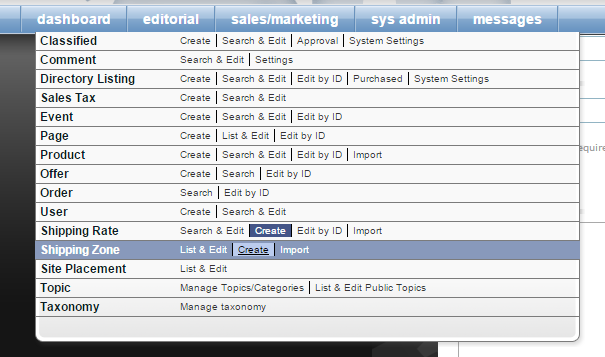 Assign your External reference ID. In this case INTERNATIONAL. 1.4. Repeat the above steps 1.1 to 1.3 until all desired countries are represented. 2. To set up your shipping rate, if one does not already exist for INTERNATIONAL, click Create next to Shipping Rate under Sales/Marketing in your dashboard. 2.1. Set the rate type to weight-based (zones). Zoom: Set the rate type to weight-based (zones). 2.2. Create a Display Name. In this case, International Shipping. This will show in your customer's shopping cart. Zoom: Create a Display Name. In this case, International Shipping. This will show in your customer's shopping cart. 2.3. Set an Internal Name. In this case, International Shipping Flat Rate (for your reference). 2.4. Add the rate you'd like to apply to International Shipping. The number represents dollars. 2.5. 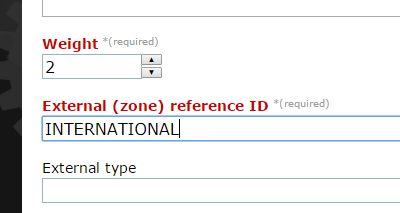 Add the weight this rate applies to, and add the External Reference ID that you assigned to your international zone when you set it up. This must match. 2.7. Create a new maximum weight shipping rate record for each desired international shipping weight class. If you have any questions, please contact your project manager for further assistance. Prev: How do I create an event product? Next: How do I customize the confirmation email message and online order receipt sent after my customer orders for a specific product?